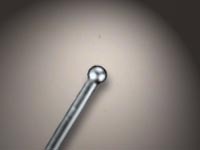 Metal guidewires are used to assist in getting thin flexible tubing (catheter tube) to the correct location in a patients body during a surgical procedure. The tube with the guidewire inside is first inserted into the patients system through a small incision. The guidewire is then removed from the inside of the tube leaving the tube in the patients body at the correct location. The tube then allow fluids to pass into or out of the body. The guidewire consists of a thin core wire through the center of a long wire coil. The core wire is then welded to the outside spiral coil wire to make a smooth hemisphere ending. Medical biopsy needles and syringes sometimes have a rounded end. 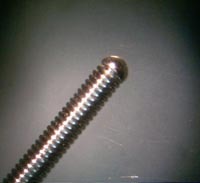 In the past, to close the tube ending manufacturers have used swaging or spinning techniques. 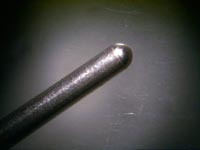 It is also possible to close the tube ending by momentarily imposing a welding arc on the tube ending to melt the tube and produce a smooth hemispherical surface. 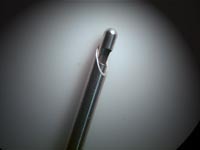 Similar in application to tube end and needle tip closures, it is possible to round the ends of wires by momentarily imposing a welding arc on the rod or wire ending to melt end material. The cohesive forces of the molten puddle tends to make a uniform hemispherical shape with a smooth unpitted surface. 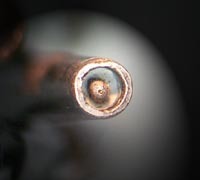 The alternative method of grinding the wire and rod ends may require a subsequent cleaning process to ensure that no dust remains that could be considered a contaminant. It is possible to create balls at the end of wires by spot welding. 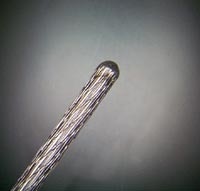 A short duration spot weld melts the wire end and the cohesive forces of the molten material pulls the material into a spherical shape. 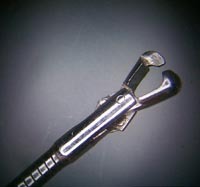 Wires with ball endings are often used as push-pull cables inside devices such as biopsy foreceps. The ball ending acts as an anchor that hooks into a clevis at the bottom portion of the foreceps jaws. Pushing and pulling the wire will then open and close the foreceps jaws. Biopsy foreceps are usually a surgical removal tool to yield tissue samples. The device requires placement of the foreceps where the tissue sample is to be obtained and remote actuation of the foreceps jaws usually by means of push-pull cable that runs through the foreceps cable assembly. Welding is often used to join the foreceps head to the spiral cable. Other components of the foreceps head assembly are sometimes welded as a joining process. When it is necessary to cut and terminate a multi stranded cable, welding is sometimes used to bind the endings of the strands together so that the wire/cable will not unravel. A simple spot weld on the wire ending achieves this purpose. The tungsten filament inside the light bulb must be joined to the external electrical connection. This often requires an extremely short duration weld to join a tungsten to molybdenum wires. The wires may only be thousandths of an inch in diameter so a short duration micro-arc weld with great precision and repeatability is required. Wire meshes are often welded together to make a tube as part of a filter or for repair of a damaged wire mesh filter for the paper industry. If the wires are of small diameter and the spacing between them minimal then the mesh can sometimes be seam welded by clamping the mesh endings together and motioning a welding torch above the weld joint. If the space between the wires is too great then the wires must sometimes be spot welded together. Thermocouples are devices whose voltage across the junction between two dissimilar metals changes according to the junction's temperature. These units can thus be used as a device to accurately measure temperature. Because thermocouple wires can be made very small, they also provide a means for the accurate measurement of local spot temperatures. Thermocouple welding usually involves a spot weld at the tip of the thermocouple body to join two miniature wires of different materials.